When last we left our green friend, he was interrupting the plans of crazed psycho Dr. Demonicus and his band of skeleton suited men. 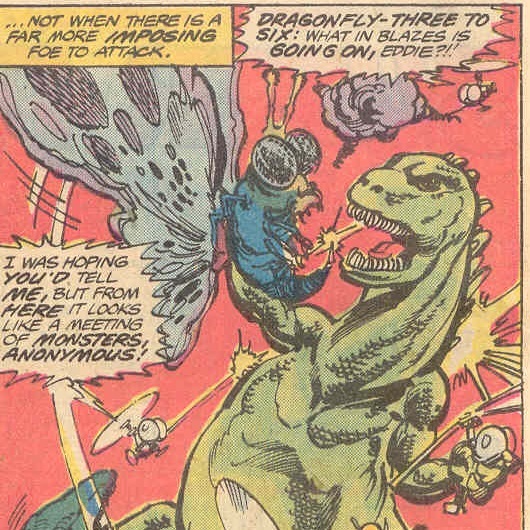 The fierce Batragon lies dead, but three new monsters await to battle Godzilla. 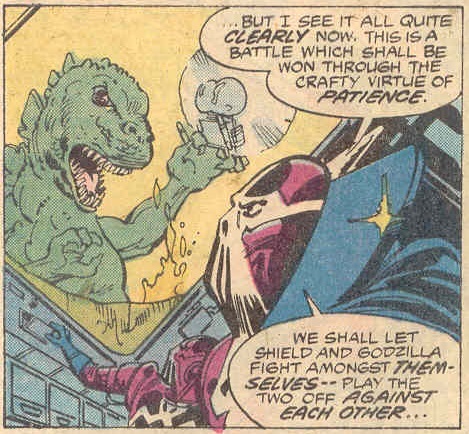 But Dr. Demonicus holds them back so Godzilla and SHIELD will fight each other first. We all know Dr. Demonicus is one of those dudes who wants to take over the world with an army of his mutant monsters, but before you can soar you must learn to walk. And Dr. Demonicus will be needing a wheelchair! 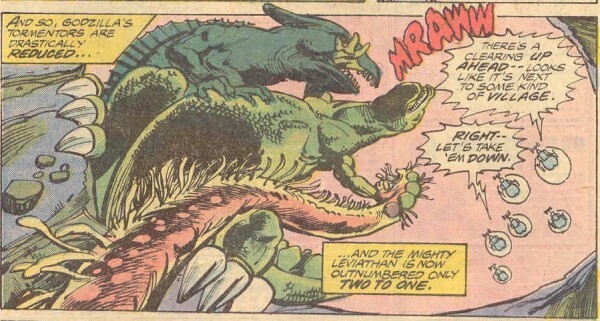 Godzilla and SHIELD battle each other until Dum Dum finally notices the other monsters in the volcano. So Demonicus let’s them free! The trio are: Ghilaron – a mutant komodo dragon with eight legs and a head crest. 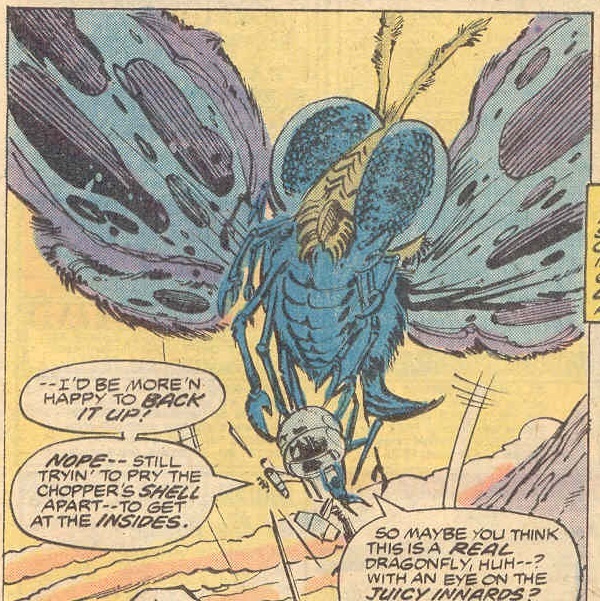 Lepirax – a gigantic moth that is in now way an evil Mothra. Centipor – a mutant centipede with tentacles on its face. The monsters attack! Fight fight fight! Gabe Jones’s fighter crashes, and he’s captured by Dr. Demonicus’s men (who are called The Demon Soldiers, in case you were wondering.) 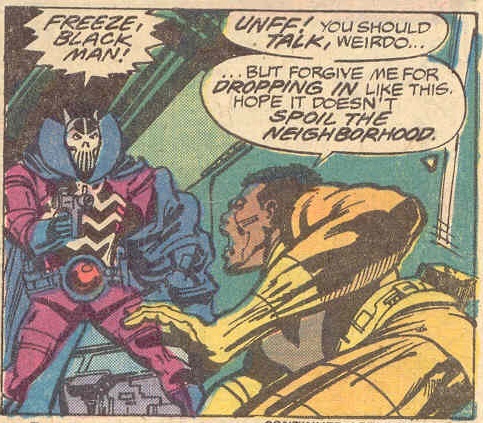 Dr. Demonicus says “Freeze, Black Man!” Wow, maybe his costume used to be his Klan costume! Dr. Demonicus then wastes time giving his life story to Gabe Jones, as Jones is stalling for time. 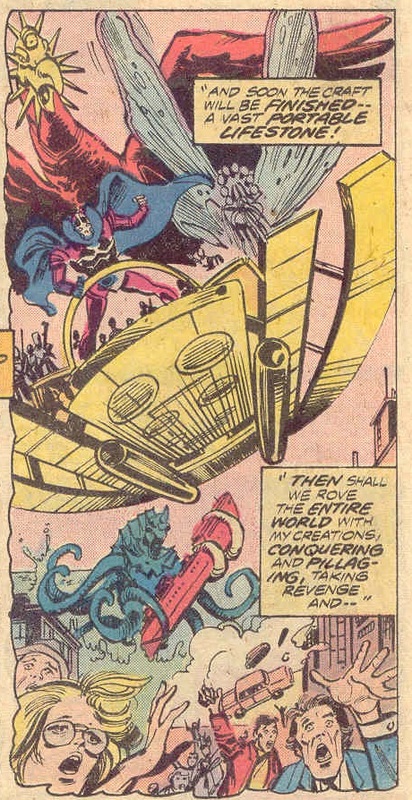 I like how SHIELD just takes crazy dudes in costumes and giant monsters in stride! During his fantasy takeover of the world via an army of giant monsters, he has two fantasy monsters that are cool but sadly don’t exist. 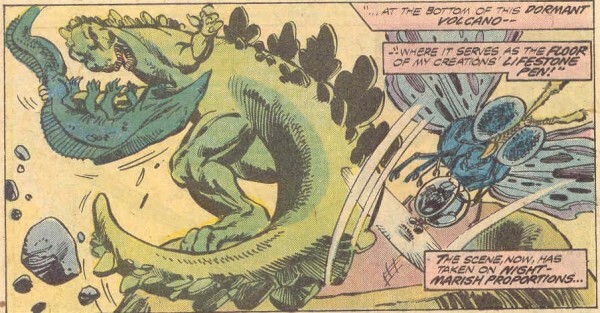 Godzilla eventually kills all the monsters thanks to his deft skill and maneuvering. And his punching and burning them to death. Which he did with deft skill and maneuvering! 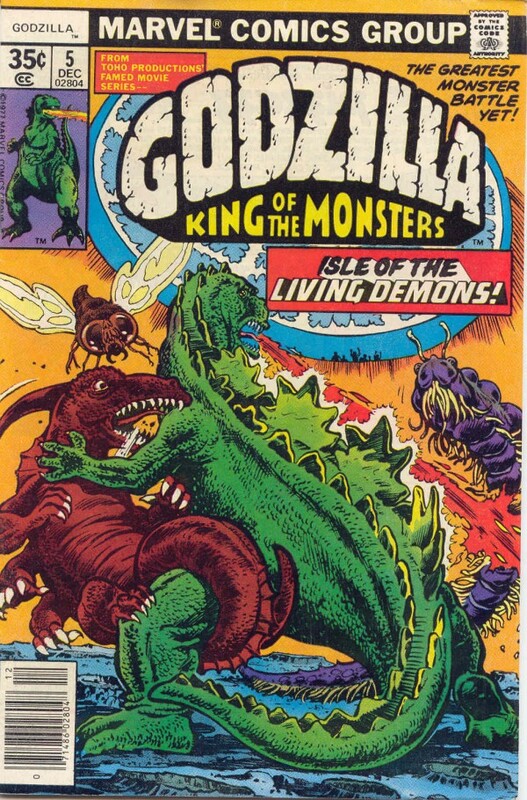 Dr. Demonicus and his goons are captured, the Eskimos are freed (and many helped to stop Demonicus’s men) and Godzilla sniffs Dum Dum before returning to the sea. Dum Dum cares not, he still thinks Godzilla is evil. But maybe a tiny bit not evil. Just a tad. 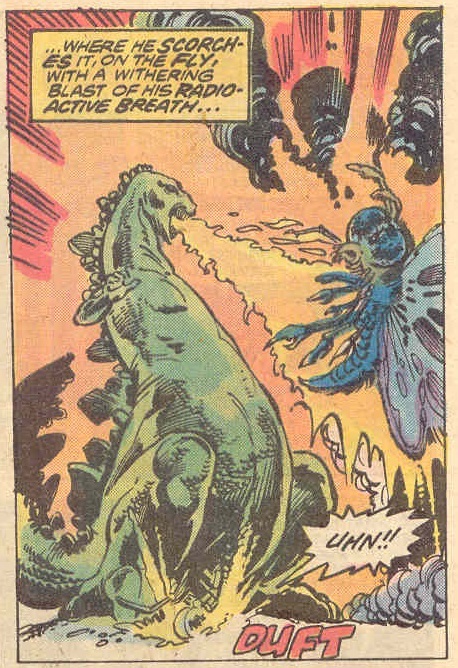 Mothra’s teenage son picks the wrong Godzilla to mess with! Interesting note, the letters page includes a letter from an Asian-American guy (Bill Wu) who mentions how he and his white friend noticed the Asians are drawn and colored like normal people, not crazy racist depictions! It’s cool to see things like this noticed and appreciated. I know one guy who won’t appreciate it, Dr. Demonicus! Time to go all A Raisin In The Sun on this mofo! Godzilla vs. Dramatic Camera Angles! Godzilla: King of the Multitaskers! 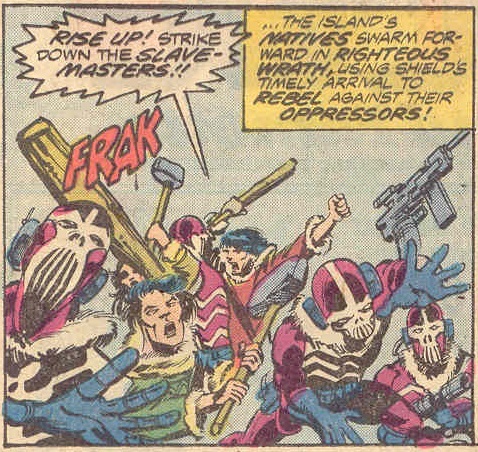 If these bad guys had just paid the Eskimos a living wage, we’d all be worshiping Dr. Demonicus right now! Lizard vs. lizard, bug vs. bug! This is literally this guy’s biggest fantasy. Enjoy this faux Mothra, because that’s all you’re gonna get!